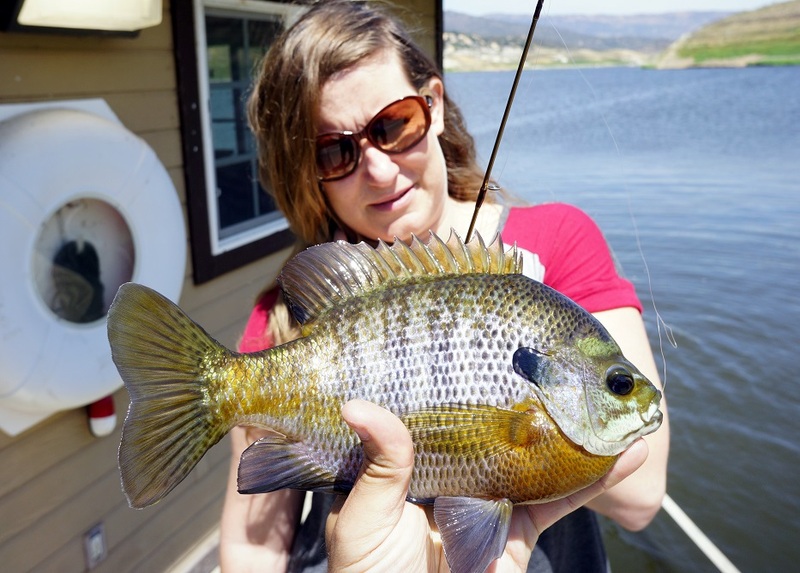 If you grew up in the United States and went fishing as a kid, chances are good that the first fish you ever caught was a Bluegill (called Bream in many areas) or one of their other Sunfish cousins which I have more or less lumped together for these purposes since they are generally caught the same way. These feisty panfish are found throughout the country in bodies of water big and small. In some areas, especially during their spawning season, the males are strikingly colored with bright blue, purple, and orange. They often come up shallow, especially in the spring and summer, and can be observed from shore if the water is clear enough. They are a great fish to get kids hooked on fishing. 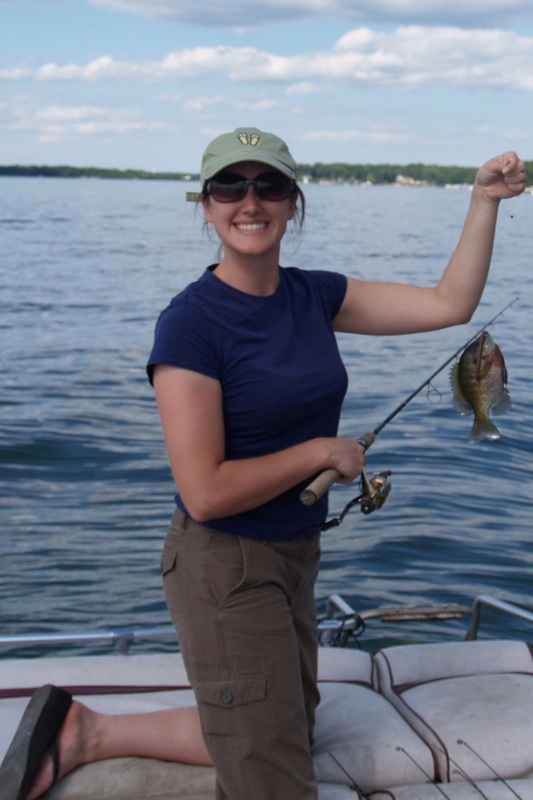 Bluegill are generally pretty easy to catch if you use small hooks that fit in their small mouths. They are very curious fish and will come check out most lures or baits that come near them. However, just like any other fish they can stop biting. 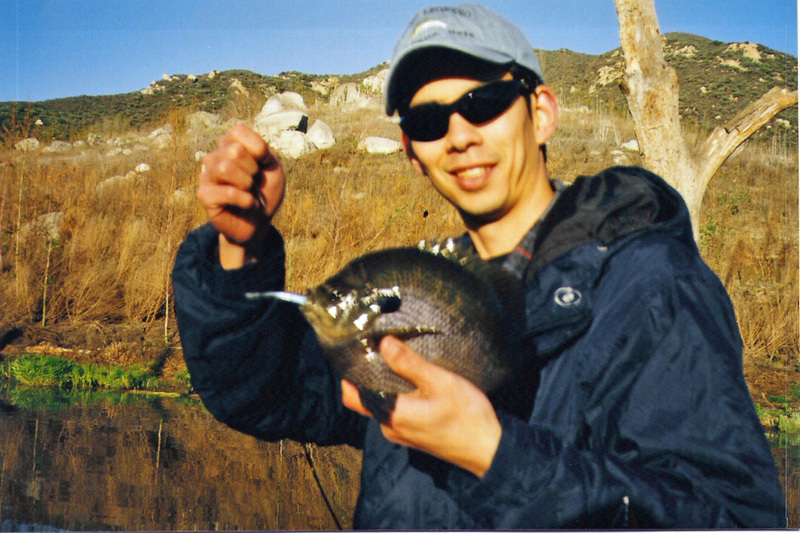 I was once fishing off of a floating dock in Southern California and catching Bluegill one after another. I probably caught over 30 in an hour. The bite eventually tapered off and then I couldn’t buy a bite despite trying everything in the tackle box. I said out loud that I thought the fish had moved on, but the park ranger overheard me and said it wasn’t so. He took out an underwater video camera with a monitor, let down the camera on a cable, and showed me the screen. 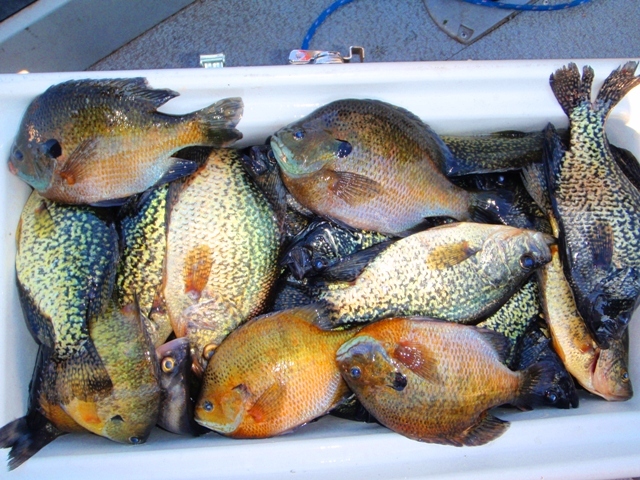 Bluegill were stacked tightly together from the bottom of the lake all the way to right under the surface. There were literally over 1,000 of them under that dock, but for whatever reason they stopped eating and I couldn’t get them to eat the rest of the day. 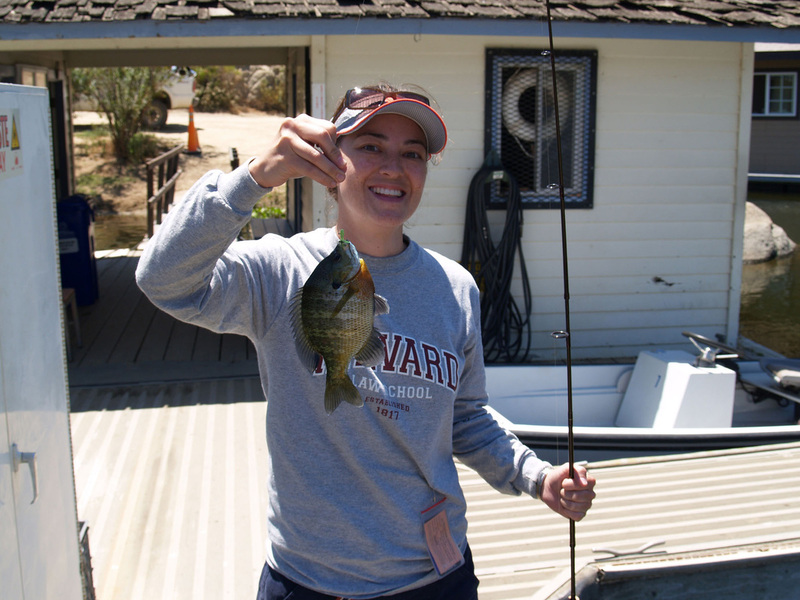 Bluegill fight well for their size but do not get very large. A 1lber is pretty decent fish, over 2lbs is a trophy and anything over 3lbs is approaching “fish of a lifetime” status. The big ones are often caught incidentally while using larger lures for Largemouth Bass. They taste ok but are kind of a pain to clean unless you have some bigger ones. They have a number of sharp spines and can cause you a little grief if you handle them improperly. If you cradle them upside down they stay very still and become much easier to unhook. That trick actually works for a lot of fish. 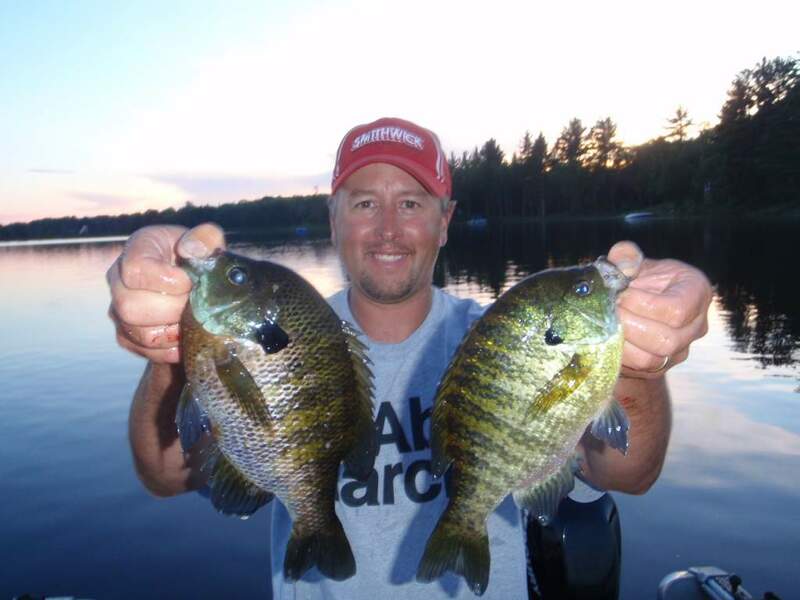 You should be able to catch pretty much any Bluegill on 2lb test line. You might go up to 4lb or 6lb if you are fishing near heavy cover. 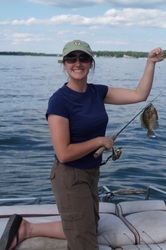 Make sure you use an appropriately small hook as even the large ones have small mouths. My ideal setup would be a Daiwa Certate spinning reel in the 1500 or 1000 size and an ultra light spinning rod. Really any small spinning reel should work though. Click here to go to read more about recommended tackle. 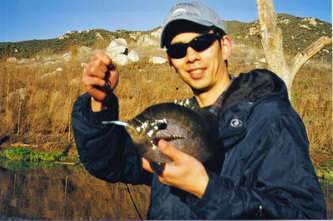 Bluegill are most easily caught on bait but will often bite lures as well. I have caught several on a bare shiny gold treble hook. They are a curious fish and will put things in their mouth just to check them out. You just need to make sure you are using a small enough hook to fit in their little mouths. My most successful Bluegill lure has been a plastic mini jig as shown below. I have never found them to be that picky on the color, but green and gold or clear with glitter are what I usually start with. I like to fish the jig very slowly, suspending it at the depth I think the fish are at and then just twitching it occasionally with the line taught to detect their nibbling bites. They often bite while the lure is falling, like most fish. Some people like to target them with tiny poppers, either with fly fishing gear or spinning gear. I have caught a few that way but I can’t say it’s been a go-to technique for me. Although it is not a good way to target numbers, all of my biggest Bluegill have been caught while I was fishing for Largemouth Bass with plastic worms or drop shotted plastics. 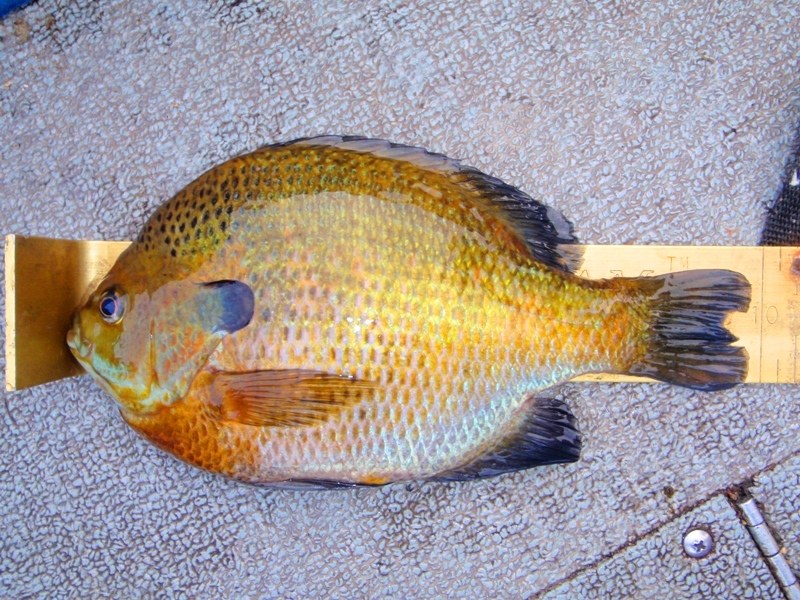 This big green sunfish, a close relative of the Bluegill, was caught while fishing for bass in Texas. 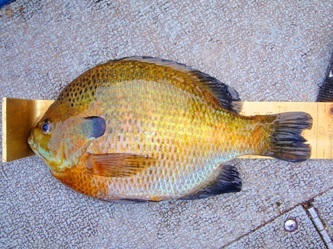 Big panfish are often caught while fishing for bass. It’s hard to beat a piece of worm fished under a bobber. If they are not biting a worm then good luck catching them on anything else. Don’t use too much worm or they will just grab the end and pull it off the hook. Crickets and mealworms supposedly work well although I have never used them. Personally I prefer to use Berkley Gulp baits like the cricket and the earthworm rather than live bait. It works just as well and it is a lot less hassle since you don't have to worry about keeping anything alive. The Berkley Power Wigglers and Power Nymphs work well (although not as well as the Gulp) and are even less of a hassle to use since they don't get your hands quite as smelly. These are a good option for kids. See links above to purchase. Large Bluegill are found in so many lakes and rivers throughout the country it’s hard to pinpoint one or two trophy locations. In general, because of the longer growing season, they get bigger in the southern half of the US. 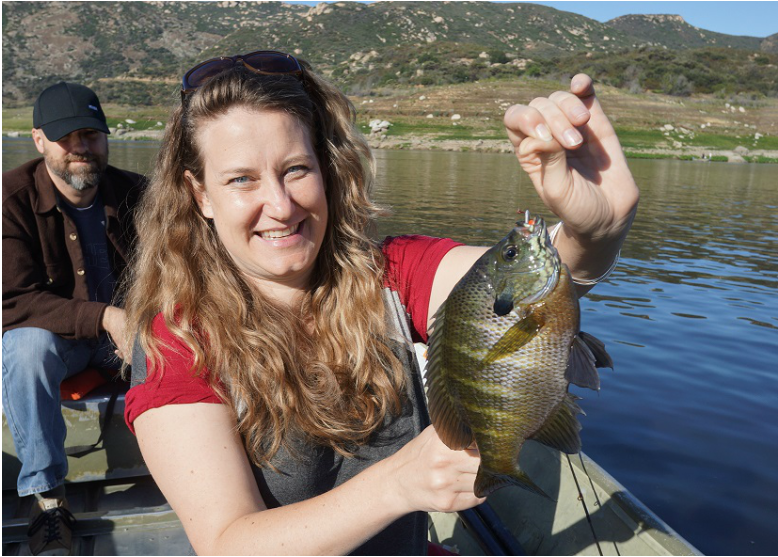 My largest ones have mostly come out of Lake Barrett, near San Diego, California.